Among millions of Holocaust victims sent to Auschwitz II-Birkenau in 1944, Priska, Rachel, and Anka each passed through its infamous gates with a secret. Strangers to each other, they were newly pregnant, and facing an uncertain fate without their husbands. Alone, scared, and with so many loved ones already lost to the Nazis, these young women were privately determined to hold on to all they had left: their lives, and those of their unborn babies. That the gas chambers ran out of Zyklon-B just after the babies were born, before they and their mothers could be exterminated, is just one of several miracles that allowed them all to survive and rebuild their lives after World War II. 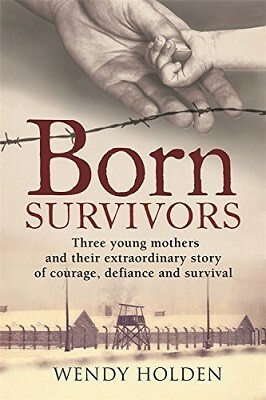 Born Survivors follows the mothers' incredible journey - first to Auschwitz, where they each came under the murderous scrutiny of Dr. Josef Mengele; then to a German slave labour camp where, half-starved and almost worked to death, they struggled to conceal their condition; and finally, as the Allies closed in, their hellish 17-day train journey with thousands of other prisoners to the Mauthausen death camp in Austria. Hundreds died along the way but the courage and kindness of strangers, including guards and civilians, helped save these women and their children. Sixty-five years later, the three 'miracle babies' met for the first time at Mauthausen for the anniversary of the liberation that ultimately saved them. United by their remarkable experiences of survival against all odds, they now consider each other "siblings of the heart." In Born Survivors, Wendy Holden brings all three stories together for the first time to mark their seventieth birthdays and the seventieth anniversary of the ending of the war.